A change was made to the map in Rep. Rashida Tlaib’s congressional office. 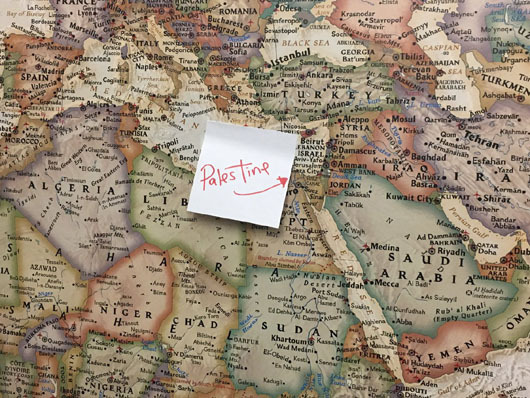 A “Palestine” sticky note was pasted over Israel. The change was noted in a Twitter post by BuzzFeed reporter Hannah Allam, who toured Tlaib’s office after the Michigan Democrat was sworn in. According to BuzzFeed, Palestinian-American comedian Mo Amer saw the map and added the note. Observers noted that the sticky has an arrow pointing supposedly where the state of Palestine would be, but really is pointing to Egypt. Tlaib, the first Palestinian-American member of Congress, backs a one-state solution and is a supporter of the Boycott, Divestment and Sanctions (BDS) movement. Her swearing-in ceremony was attended by Women’s March leader Linda Sarsour, who reports say still refuses to condemn Nation of Islam leader Louis Farrakhan’s frequent spouting of anti-Semitism and homophobia. Tlaib also announced her own upcoming congressional delegation trip to the West Bank, details of which have not been publicized. After her swearing-in, Tlaib said: “And when your son looks at you and says, ‘Momma, look, you won. Bullies don’t win.’ And I say, ‘Baby, they don’t.’ Because we’re gonna go in there and we’re gonna impeach the mother***er,” in reference to President Donald Trump. Democrat Sen. Joe Manchin described Tlaib’s remarks as “disgusting,” and apologized to all members of the U.S. Congress as well as to the American people for the language used by his colleague.